This is a brilliant board game which up to four people aged 7+ can play together. You don’t know who or what is featured on the mask you are wearing. As you proceed around the board, you have to ask questions of the other players (helpful hints are provided) to get your animal or human character right. 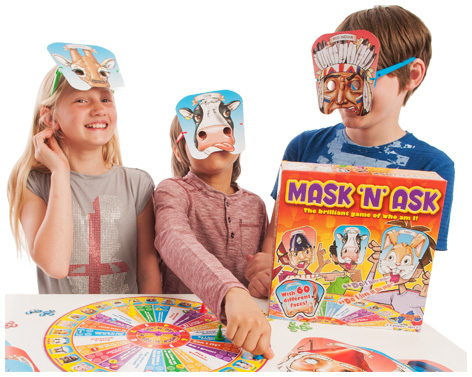 With two Mask 'n' Ask boards to choose from - humans or animals – there’s huge opportunities for varied game play. Characters include wizards, firemen or clowns, whilst animals include pigs, tigers and even cows! Thirty double sided masks are included as well as four playing pieces and a question spinner. Check out Drumond Games website for a fantastic selection of family games such as His and Hers, Catch Phrase, Wordsearch and Rapidough. Please tell us what you think of Mask 'n' Ask by Drumond Park.